Molting is normal for most birds, including parakeets. Sometimes called budgerigars or budgies, parakeets lose feathers to make room for new ones to grow. The most obvious sign your parakeet is molting is that it looks ragged, with many dropped feathers littering the bottom of his cage. He might also exhibit some behavioral signs. Other problems, such as disease, can cause feather loss, so always monitor your bird during his molt to ensure no other issues exist. Parakeet looking at itself in mirror. Parakeets typically lose a few feathers at a time while they molt -- enough for you to notice them falling but not enough to inhibit their flying abilities. New feathers grow in quickly to replace the fallen ones, starting out as pinfeathers, encased in hard shells. Your parakeet might appreciate your help removing the hard shafts, especially in hard-to-reach places. Rolling the shafts gently between your fingers usually helps them break apart and fall off, freeing the soft feathers inside. Your bird might look extra fluffy because the new, still-growing feathers lie differently on his body than mature ones. Molting shouldn't cause large bald spots, although you might be able to see small spots of skin briefly. Many parakeets find molting stressful, and their behavior often reflects it. Your parakeet might flap his wings while sitting still or may take short, powerful flits around his cage to dislodge loose feathers. Some birds appear upset, sad or listless. 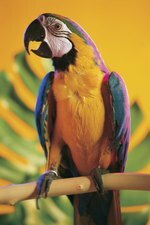 Your bird might be quieter than normal, or he might require more sleep than when he's not molting. While molting is a normal process, feather loss sometimes signifies a problem. Look for large bald patches that last more than a few days or feathers that fall in between your bird's normal molting cycles. 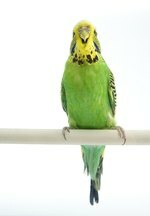 Ask your vet about these symptoms, which can appear for numerous reasons, including boredom, poor nutrition, feather lice, dry air and French molt -- which is sometimes called budgerigar fledgling disease because it's often seen in young budgerigars. With French molt, your bird's beak might also appear flaky. Some birds recover quickly, but the feather loss can be so severe that feathers never grow in correctly. Your vet can determine the proper course of treatment, which likely includes dietary changes or vitamin supplements. Because molting takes a toll on your bird, keep him comfortable by giving him a bit more attention. His feathers help insulate him from cold, and as he loses feathers through molting, he's more susceptible to cool temperatures. Keeping the room warmer than normal helps. He burns more calories as he grows feathers, so feed him more than normal -- at least 25 percent more, recommends the Hartz website. Grooming him helps your parakeet remove loose feathers, get rid of pinfeather shafts and enjoy your company to help keep the molting blues away.